East Texas Livestock was built in 1981 with main focus of design being on two aspects of handling cattle: ease of movement and shrink minimization. The facility is built with high ceilings, wider alleys, angled pens, metal pens instead of wood, extra lighting, water and feed pens, and almost 4 acres under shed to keep cattle out of the elements and allowing the capacity of up 5,000 head to be handled. While most of these seem to be common sense, very few barns have these kinds of accommodations. The high ceilings help to keep airflow throughout the barn, which in return minimizes shrink by not trapping heat inside the pens. The wider alleys help when moving cattle to prevent trampling and crowding while being sorted and moved. The angled pens help to avoid injuries to cattle by sharp corners and limiting the chances of instances such as a “hip being knocked off”. The pens are all made of metal rod and pipe, which also plays a major factor in minimizing shrink, by helping with airflow and not trapping heat unlike wood pens. We also have extra lighting, which helps to reduce the chance of injury and allows cattle to be moved more efficiently. With having almost 4 acres under shed cattle are not crowded which helps with many thing but most importantly health of cattle and minimizing the spreading of sickness (which is a very attractive accommodation to buyers). East Texas Livestock also has an on-site barn manager that is available and setup to receive cattle 24 hours a day, 7 days a week. 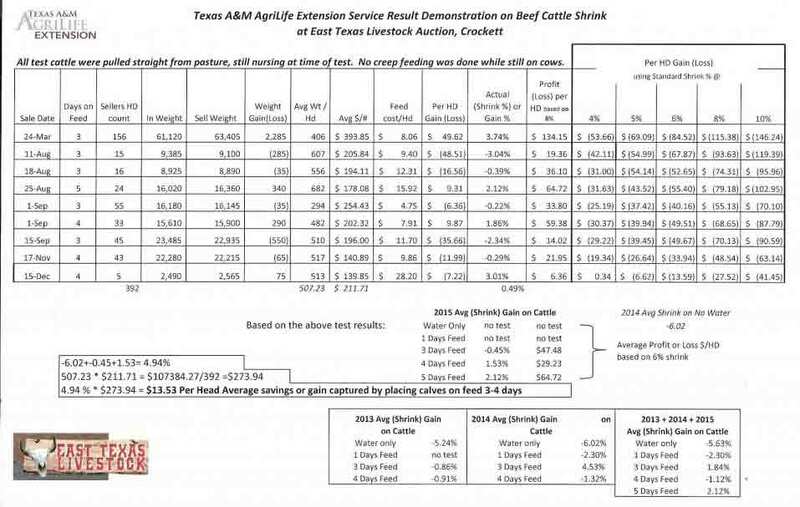 In 2013 East Texas Livestock started a partnership with Texas A&M University to research shrink and generate feeding plans to minimize it. For three years dozens of tests have been run with over 1900 head of calves being sampled. Many producers believe the age old myth that the best way to minimize shrink is to pull a calf off the cow at the last minute on the day of the sale then take it directly to the auction. Contrarily by doing this, the average shrink is 5.63%. However, if cattle are brought in 3 days in advance and put on our Shrink Minimization Program the average calf not only didn’t shrink any but actually gained back all of the weight lost by shrink and even put on 1.83% of additional weight. Placing cattle on feed generates an additional $71.68 per head. The average feed cost per head of placing cattle on feed for three days prior to the sale is $8.47(We do not charge any yardage fees). If 40 head are sold, the savings going back to the seller is $63.21 per head or $2,528.40 total.